Davao – Over the years, Samal Island located in the Davao Gulf has been recognized to have one of the best beaches in the Philippines. Its beautiful mountain landscape, crystal clear waters, and fine white sand are a perfect combination for people who want to unwind and enjoy pure bliss. Not much was known about this town until Hilario Moncado established the religious sect called the Filipino Crusaders World Army (FCWA).The FCWA, or more famously known as the Moncadista, was a religious organization during the Commonwealth period that followed the teachings of their spiritual master, who was believed to be the Filipino messiah. After World War II, a large number of people from different parts of the country flocked to Samal Island to be followers and to live close by to the religious headquarters, where the group’s Supreme Master resided. Two settlements were constructed, a 23-hectare residential lot in Babak and a 19-hectare patch of land in Limao that occupied the swanky abode of the Moncados, known as the White House. Other recognized villages of the group are situated in Barangay New Israel in Makilala, North Cotabato, Lanao del Sur, and in Sudlon II, Cebu where a three-story Moncado Hotel was erected. Hilario Moncado, the founder and commander-in-chief of the religious sect, was thought to possess supernatural powers that lured millions of believers during its heyday. A native of Balamban in the province of Cebu, he was born on Novermber 4, 1898 to Gregorio Moncado and Filomena Camino. At an early age, he migrated to Hawaii and worked in a sugar cane plantation. Later, he relocated to the mainland United States where he spent most of his life. In 1925, he founded the Filipino Federation of America that became an avenue for all Filipino immigrants throughout America and Hawaii. Eventually, two religious groups have joined the organization, the Equifrilibicum World Religion and the Moncadian Church of the Philippines. The group’s population grew bigger in no time and expanded to the Philippines, where the seat of the Moncadista was constructed. Samal Island was the most popular among its followers, and thousands of them gathered and settled in the island, where some of them could still be found today. Members of the sect were not allowed to eat meat from animals with legs; instead, they grew vegetables and other leafy products for consumption. Seasoning or salt was prohibited, and members, especially in Limao, were known to eat mostly raw food. To mimic God, followers donned long hair and beards, while alcohol as well as smoking was also off limits to live a life more desirable to God. A spiritual initiation and sacrifices, such as fasting and abstinence, were required for each member at the beginning. To ward off perils and temptations, oral recitations of certain prayers were necessary to purify oneself. The sect was made up of 12 divisions, namely, Commercial, Finance, Labor, Legal, Welfare, Musical, Membership Organization, Publication, Welfare, Youth, and Religious. Church day is every Saturday for Moncadistas, and everyone is encouraged to continuously read the bible under the Spiritual Director’s supervision. Various controversies contributed to the demise of the sect, and a large number of the members either went back to their old religion or transferred to a new one. When Hilario Moncado passed away in 1956, an acting president was elected during the organization’s convention to continue the visions of the late commander-in-chief. Although the volume of followers have dropped since its inception nine decades ago, a small yet very close-knit population of Moncadistas are still present in Samal Island. 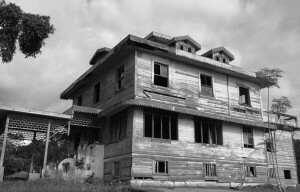 The famous white house of the Moncados has since turned into a tourist site, with frequent visitors both local and foreign. Many members have embraced the modern world and understood that a morally upright life is not to physically copy God but to follow his teachings. To this day, the Moncado statue stands in Limao, a representation of its glorious past and a constant reminder that on this site once lived the Supreme Master of the Moncadista.